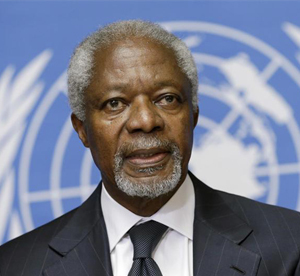 Mr. Kofi Annan has done more than most to catalyze political and public opinion to an understanding that the environment is a fundamental pillar of sustainable development. They note the various reports, requested by the UN Secretary-General in the run up to the 2005 World Summit in New York including “A More Secure World: Our Shared Responsibility” and “In Larger Freedom”. The Zayed jury also noted the personal leadership of the Secretary-General at the World Summit on Sustainable Development in 2002 in South Africa that addressed the Water, Energy, Health, Agriculture and Bio diversity (WEHAB) themes. Five years ago, recognizing the potential threat that environmental degradation posed for people around the world, Mr Annan also called for the first-ever international scientific assessment of the health of the world’s ecosystems. The Millennium Ecosystem Assessment reported in 2005, again in the run up to last September’s World Summit. Mr Annan has emphasized the importance of the multilateral system in all facets of his work, convinced that global environmental challenges require global cooperation.